Hyperglycemia seems to be an important causative factor in the development of micro- and macrovascular complications in patients with diabetes (1,2⇓). Various pathophysiological and biochemical mechanisms have been proposed to explain the adverse effects of hyperglycemia on vascular cells (3–6⇓⇓⇓). Among various possible mechanisms, it is widely accepted that high glucose level and a diabetic state induce the persistent activation of the diacylglycerol (DAG)-protein kinase C (PKC) pathway in micro- and macrovascular tissues of diabetic animals and of patients with diabetes (7–12⇓⇓⇓⇓⇓). Because PKC is a critical intracellular signaling molecule that can regulate many vascular functions, it is to be expected that activation of PKC may cause alteration in various vascular functions in diabetes. However, accumulating evidence has shown that oxidative stress also may play a role in the development of diabetic vascular complications. A number of in vitro and in vivo studies suggest that the production of reactive oxygen species (ROS) is increased in diabetes (13–16⇓⇓⇓). It has been postulated that ROS production in diabetes may be enhanced by hyperglycemia through various mechanisms such as enhanced formation of glycation products (17), altered polyol pathway activity (18), and increased superoxide release from mitochondria (19). In contrast, attention is increasingly focused on NAD(P)H oxidase as the most important source of ROS production in blood vessels (20–23⇓⇓⇓). Recent reports have implicated that this oxidase may be involved in the pathophysiology of various vascular diseases, including hypercholesterolemia (24), atherosclerosis (25–27⇓⇓), and hypertension (28). In this review, we show that a PKC-dependent activation of NAD(P)H oxidase may be an essential mechanism responsible for increased ROS production in diabetic vascular tissues. This may provide novel insights into antioxidative therapy for preventing diabetic vascular complications. In animals with chemically or genetically induced diabetes, the PKC activities in the membrane pool, which is the active fraction, have been shown to be elevated in many vascular tissues such as the aorta, heart, retina, and renal glomeruli by us and other investigators (7–11⇓⇓⇓⇓). In parallel with the changes in PKC activity, the total DAG level in these tissues has also been shown to be increased. Because the total DAG level increases in parallel with the PKC changes, these findings suggest that diabetes enhances the PKC activities by increasing total DAG level of the tissues. In cultured vascular cells, high glucose level also induces PKC activation in parallel with DAG change (7–12⇓⇓⇓⇓⇓). The mechanism for the increased level of DAG by high glucose seems to be due to the ability of the glucose to increase the de novo synthesis of DAG. The glucose-induced activation of the DAG-PKC pathway in the vascular cells probably could be linked to the dysfunction of vascular walls in diabetes. This notion has been supported by the increasing numbers of studies showing that many vascular abnormalities in retinal, renal, and cardiovascular tissues observed in diabetic animals can be normalized by PKC inhibitors (12,29–33⇓⇓⇓⇓⇓). The role of oxidative stress in atherogenesis has received increasing attention in recent years. Oxidative modification of lipoproteins is critical for atheromatous lesion formation. In addition, ROS reacts with nitric oxide, resulting in loss of nitric oxide’s antiatherogenic properties. ROS affect a large number of various signaling pathways and proteins and cause DNA damage in vascular tissues. Recent reports have indicated that vascular NAD(P)H oxidase–driven ROS production may play a role in the pathophysiology of various vascular diseases, including hypercholesterolemia, atherosclerosis, and hypertension. Therefore, we examined the role of NAD(P)H oxidase in high glucose level–induced ROS production in cultured aortic endothelial cells, smooth muscle cells, and renal mesangial cells using electron spin resonance (ESR) spectroscopy (34). Exposure of cultured vascular cells to high glucose level (400 mg/dl) for 72 h significantly increased ROS production as compared with low glucose level (100 mg/dl). Treatment of the cells with PMA, a protein kinase C (PKC) activator, for 3 h also increased it. In addition, such increases by high glucose level or PMA were restored to control values by diphenylene iodonium (an NAD[P]H oxidase inhibitor) and calphostin C or GF109203X (a PKC inhibitor). In contrast, other inhibitors of flavoproteins, such as xanthine oxidase (oxyprinal), nitric oxide synthase (l-N-monomethyl arginine), and mitochondrial electron transport chain oxidase (rotenone), were ineffective. These results suggest that high glucose level stimulates ROS production via a PKC-dependent activation of NAD(P)H oxidases in vascular cells and renal mesangial cells (Figure 1). To explore the molecular mechanism, we examined the effect of high glucose level on the small GTP-binding protein Rac-1 activity, which is a key regulator of NAD(P)H oxidase in many cells (35), including vascular tissues. In parallel with the NAD(P)H oxidase activity, high glucose level induced an activation of Rac-1 and this activation was inhibited by PKC inhibitors (unpublished data). These results suggest that the molecular mechanism underlying high glucose–induced NAD(P)H oxidase activation may be via a PKC-dependent activation of Rac-1. Figure 1. Mechanism for increased ROS production induced by diabetes and insulin-resistant state. The insulin-resistant state as well as diabetes is linked with atherosclerosis. One of the metabolic features of insulin resistance is a defect in the insulin-mediated lowering action of fatty acids. We found that not only high glucose level but also saturated nonesterified fatty acids (NEFA) can stimulate de novo DAG synthesis and PKC activity in cultured aortic endothelial cells (EC) (36) and smooth muscle cells (37) and subsequently induce the increase in ROS production via a PKC-dependent activation of NAD(P)H oxidase (34) (Figure 1). The elevated concentration of plasma NEFA in patients with obesity or an insulin-resistant state may induce the increase in ROS production. This notion is consistent with the previous findings showing that raising plasma NEFA elevates vascular resistance, raises BP (38), and impairs the lower extremity vascular endothelium-dependent vasodilation (39). 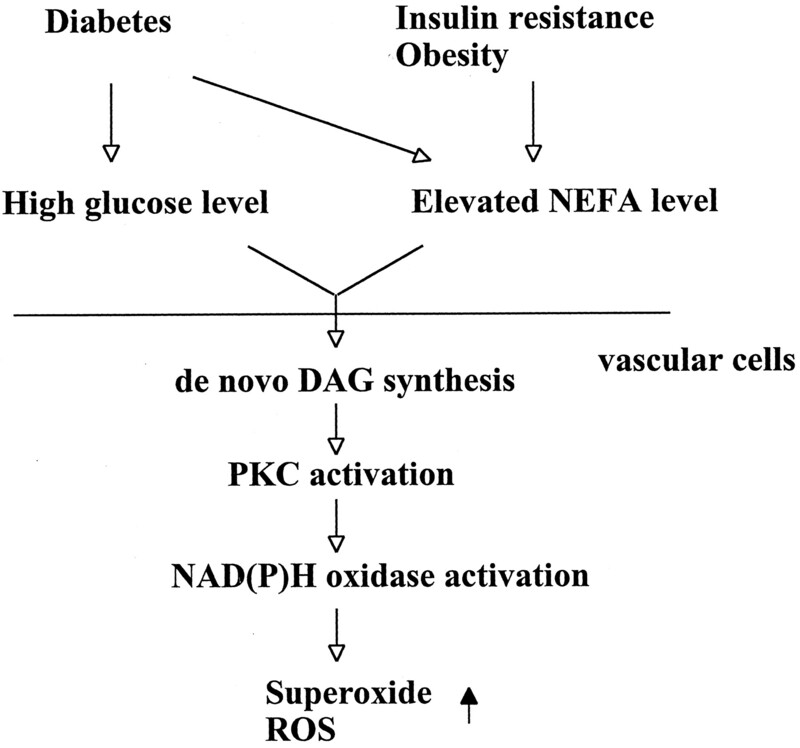 Thus, high glucose–induced or elevated NEFA–induced PKC-dependent activation of NAD(P)H oxidase may cause the increased ROS production in patients with diabetes or an insulin-resistant state. Several reports have recently shown that the expression of NAD(P)H oxidase subunit proteins (p22phox, p47phox, or p67phox) is upregulated in aorta from animal models of diabetes (40,41⇓) and in saphenous vein and internal mammary artery from patients with diabetes and coronary artery disease (42). Furthermore, this enzyme-driven superoxide production was reported to be involved in vascular dysfunction such as impaired endothelium-dependent vasodilation found in type 2 diabetes animal model (41). These results further support the idea that vascular NAD(P)H oxidase may play a role in the pathogenesis of macroangiopathy associated with diabetes. With respect to diabetic microangiopathy, one report showed that the activity of NAD(P)H oxidase was increased in the retina of diabetic rats and that this might be involved in the development of diabetic retinopathy (43). We examined the expression of essential subunits of NAD(P)H oxidase, NOX-4 and p22phox, in the kidney from streptozotocin-induced diabetic rats (44). The levels of mRNA of both NOX4 and p22phox expression were significantly increased in the kidney from diabetic rats as compared with control rats. Immunohistochemical analysis showed that the expression of NOX4 and p22phox were clearly increased in both distal tubular cells and glomeruli from diabetic rats. Both the localization and the expression levels of these components were in parallel with those of 8-hydroxy-deoxyguanosine that is a marker of ROS-induced DNA damage. Interventive insulin treatment for 2 wk completely restored the increased levels of these components in diabetic kidney to control levels in parallel with the normalization of 8-hydroxy-deoxyguanosine level. These results suggest that the expression of NAD(P)H oxidase subunits NOX4 and p22phox are upregulated in the kidney of diabetic rats and that NAD(P)H-dependent overproduction of ROS may cause DNA damage in diabetic renal tissues. Vascular NAD(P)H oxidase may play an essential role in the development of diabetic microangiopathy such as nephropathy. However, further studies should be done to prove the role of PKC in the upregulated expression of this oxidase in macro- and microvascular tissues in vivo. Inhibition of oxidative stress using various antioxidants has shown some success at preventing the diabetic vascular complications in animal models. However, results of studies in humans have generally been negative. One possible reason for its ineffectiveness is that radical scavengers such as vitamin E may serve not only as an antioxidant but also as a pro-oxidant. For example, vitamin E reacts with radicals and subsequently generates tocopheroxyl radicals. Another problem in antioxidative therapy is the lack of a direct and sensitive method to evaluate oxidative stress in vivo. Here we used the in vivo ESR method to evaluate the effect of various agents on the increased ROS production in diabetic animals. This in vivo ESR method has been recently developed for a noninvasive, sensitive in vivo measurement of free radical generation in living animals. Free radicals such as ROS have unpaired electrons, which can be detected selectively and sensitively by ESR spectroscopy. However, conventional ESR spectrometers have significant limitations for analysis in living animals because the high-frequency microwaves used are absorbed by water, resulting in the development of fever. Recently, Utsumi et al. and other investigators (45–47⇓⇓) showed that a combination of a low-frequency ESR spectrometer with nitroxide radicals as probes enables a sensitive, real-time in vivo measurement of free radicals in living animals. Using this method, we examined whether several agents that are expected to block the process of activation of NAD(P)H oxidase really normalize the increased oxidative stress in diabetic animals. We first examined the effect of PKC inhibitor on the increased ROS production in streptozotocin-induced diabetic rats. The increased ROS production in diabetic rats at 2 and 4 wk after onset of diabetes was confirmed by in vivo ESR measurement. Acute administration of the PKC inhibitor CGP41251 (50 mg/kg) significantly inhibited the increased ROS production in diabetic rats, clearly suggesting the role of PKC in the increased ROS production in diabetes (unpublished data). PKC inhibitor may inhibit ROS production in diabetes via its inhibitory effect on high glucose–induced activation of NADPH oxidases. For clinical use, however, long-term in vivo use of non–isoform-specific PKC inhibitors could be potentially harmful. Among various isoforms, preferential activation of the PKC-β isoform is reported to occur in many vascular tissues in the diabetic states (8,31⇓). Presently, one of the most promising specific inhibitors of PKC-β is LY333531. Oral administration of LY333531 to diabetic rats has been reported to prevent the increased albumin excretion, elevated glomerular filtration, and abnormal retinal hemodynamics (31). Clinical trials are now ongoing to assess the effects of PKC-β inhibition on diabetic retinopathy and neuropathy. The beneficial effects of PKC-β specific inhibitor might be also at least in part due to its inhibitory effect on oxidative stress. Further investigation into the antioxidative properties of this agent is imperative. The effect of the 3-hydroxy-3-methylglutaryl CoA reductase inhibitors (statins) on cardiovascular diseases is mainly attributed to their cholesterol-lowering properties, but accumulating evidence has shown that some beneficial effects of these agents may be independent of plasma cholesterol levels. Notably, recent reports have revealed that statins may inhibit ROS production in vascular cells probably via inhibition of angiotensin II–induced NAD(P)H oxidase activation (48,49⇓). Therefore, we expected that statins might also inhibit the high glucose–induced NAD(P)H oxidase activation and finally prevent the increase in ROS production in diabetes. Oral administration of pitavastatin for 2 wk normalized the increased ROS production in diabetic rats to control levels (unpublished data). For activation of NAD(P)H oxidase, active Rac has to be anchored in the membrane via its geranylgeranyl tail. Statins may inhibit the high glucose–induced activation of Rac by inhibiting the geranylgeranylation-dependent translocation of Rac from the cytosol to the cell membrane. This notion may be supported by several clinical studies showing that statins prevent a decline in renal function and cause a decrease in albumin excretion in diabetic nephropathy (50,51⇓). These beneficial effects of statins for diabetic nephropathy may be explained by their antioxidative properties rather than their cholesterol-lowering effect. Recent epidemiologic studies have established that angiotensin II–converting enzyme inhibitors (ACEI) and angiotensin II receptor blockers (ARB) have a protective effect on the development of diabetic nephropathy (52–54⇓⇓). One report showed that ACEI and ARB prevented the development of albuminuria in streptozotocin-induced diabetic rats in parallel with the prevention of increased expression of p47phox component of NAD(P)H oxidase and its oxidative products (55). We also found that oral administration of Olmesartan (3 mg/kg) for 3 d partially inhibited the increased ROS production in diabetic rats by in vivo ESR measurement (unpublished data). Although the beneficial effects of ACEI and ARB on diabetic nephropathy are thought to be secondary to changes in glomerular hemodynamics, these results suggest that antioxidative properties of these drugs may also play an important role. The inhibition of increased oxidative stress in diabetes by these agents strongly supports the notion that the PKC-dependent activation of NAD(P)H oxidase may be a main source of ROS production in diabetes. 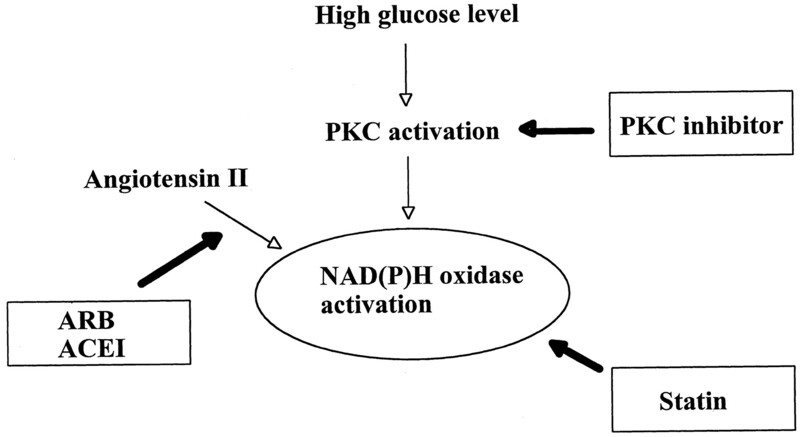 The mechanism of PKC-dependent activation of vascular NAD(P)H oxidase may be a new target of antioxidative therapy for preventing the diabetic vascular complications (Figure 2). Figure 2. Possible antioxidative agents for diabetic vascular complications. We showed here that a PKC-dependent activation of vascular NAD(P)H oxidase may play a major role in the increase in ROS production in diabetes and finally may contribute to the onset or development of diabetic micro- or macrovascular complications. Such a mechanism may be a new target of antioxidative therapy for preventing diabetic vascular complications. This work was supported by a Grant-in-Aid for Scientific Research (no. 11671126) from the Ministry of Education, Science and Culture, Japan, and the Takeda Medical Fund. This work was performed in part at Kyushu University Station for Collaborative Research.